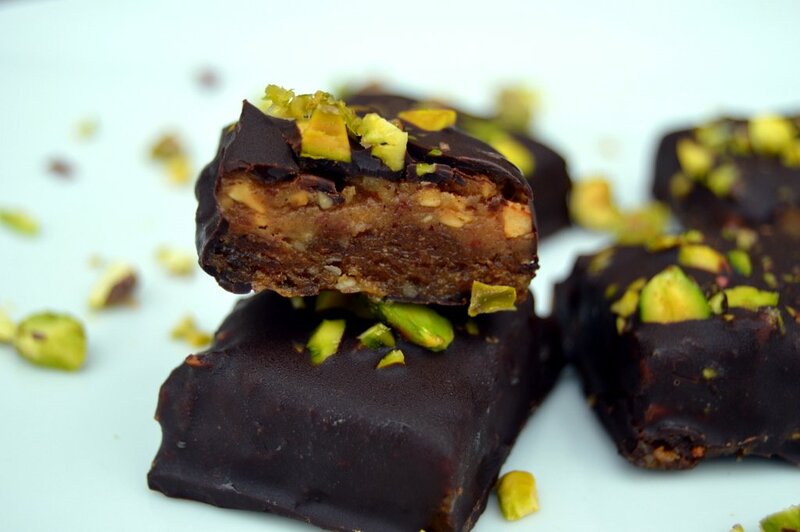 Healthy alternative to snickers that are vegan, paleo and easy to make. They are refined sugar free and this homemade recipe has a sprinkle of salt for a salted caramel flavour. 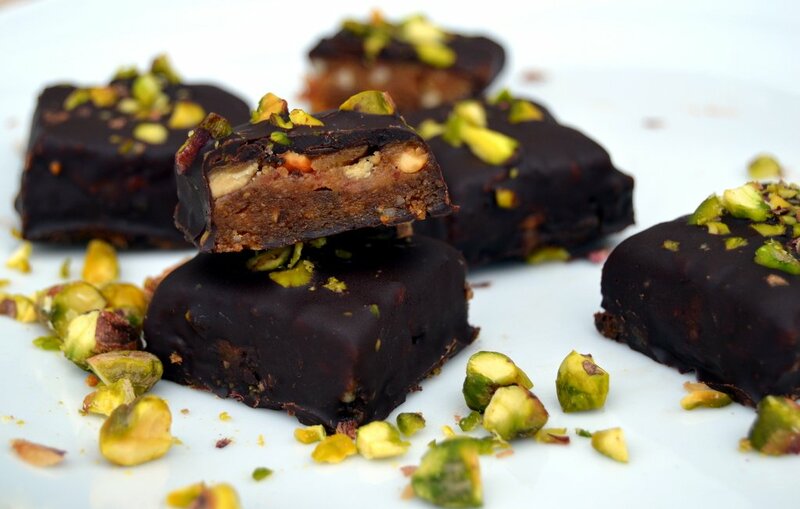 A clean candy bar recipe that can be made easy raw vegan. A great recipe to make with children as it doesn’t involve anything hot and you need to use your fingers. Even the dipping in chocolate is easy and fun. 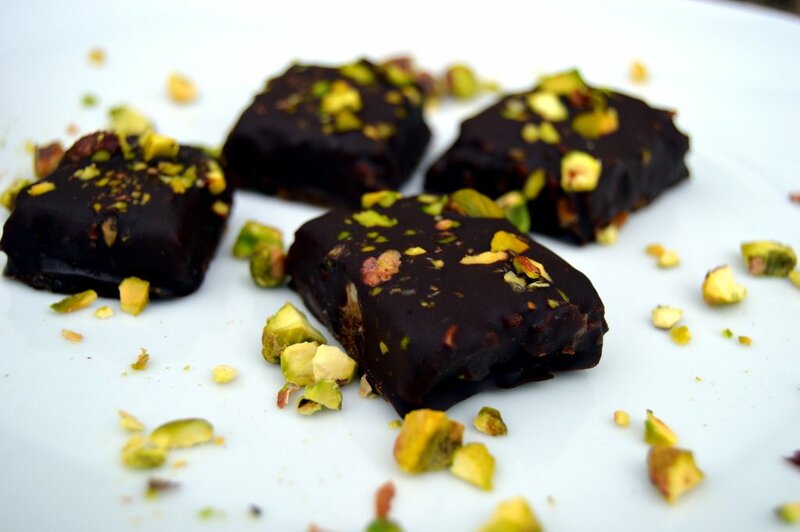 I’ve decorated the ones in the photos with a few chopped up pistachios but any chopped nut on top looks great and adds texture. You can substitute the peanut butter for any other nut or seed butter. It works really well with almond butter or cashew nut butter. Crunchy nut butter works best to give the right texture. Make a nut-free version by replacing the nuts with either pumpkin or sunflower seeds or both. It will have a slightly earthier flavour but still tastes great. Blend together the almonds and dates until they are broken up and combined. Spread the mixture out in a dish using your fingers. Mix together the peanut butter, maple, sea salt and vanilla. Spread the nutty salted caramel on top of the almond and date base. Place in the freezer for half an hour to firm up. Remove from the freezer and chop into small bite size squares. Melt the chocolate and chop up the nuts for the topping. Hold each square with a fork over the bowl of chocolate and spoon over melted chocolate. Sprinkle on the nuts while the chocolate is still liquid then put on a wire rack in the fridge. Enjoy these salted caramel treats straight away or store in the fridge where they will stay good for a few weeks. What kind of chocolate did you use? I am trying to find a “healthy” chocolate replacement? Is this organic dark chocolate? Thanks! Hello, I used a very dark 84% chocolate. Even people with a sweet tooth like this dark chocolate as its only a thin coating and there is plenty of sweetness from the dates. Does dark chocolate have the same effect on the body as “sugar”? Omg the recipe is wrong! It states ONE tsp of sea salt but the video states 1/2. I’m glad I went with my instincts and didn’t follow the recipe lol. So the end product was good, however my blender had challenges with just the dates and almonds. I think a little water would have done me justice. I had to put water in my fingers to press out the date almond mix. I completely forgot to add the vanilla but it was still so good so I’m sure next time will be even better. My particular sea salt may be more potent so next time I’ll use a little less. The recipe could even do without it for being non salted caramel. Ialso left it on the freezer a little too long so it was challenging to cut it. I got lazy at the end and only layered the top with chocolate. These are definitely a winner. If you want to use raw cacao instead of chocolate that would that recipe look like? I bet that will taste great! I like to have twice as many seeds than nuts so will try it also. Made them – absolutely heavenly!